Click on the guide above to view. You can also print out or download and save a copy too! (You need Adobe Acrobat Reader to view these downloadable versions, Download Adobe Acrobat Reader). 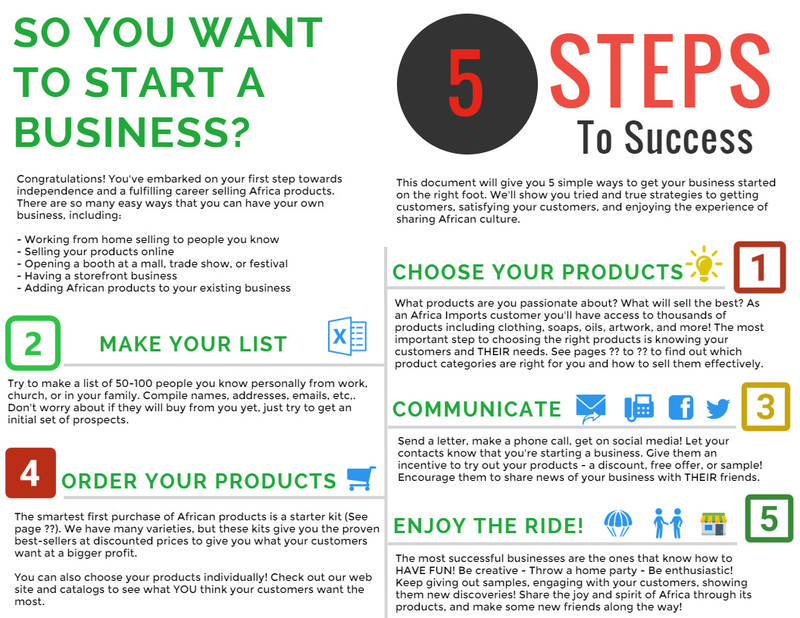 This guide gives you the help you need to start out successfully. Africa Imports has spent more than 19 years creating the best and largest selection of African products anywhere. You get step-by-step instructions that give you the fastest way to grow your own business. These same ideas that others have used to grow African businesses can give success to you. Africa Imports only succeeds if you do. I hope this guide is a big help to you. Africa Imports is a wholesale supplier of products to wholesale customers. By starting your own business, you will have a wholesale account with access to wholesale prices, that are marked down lower than retail prices. This gives you a great opportunity to earn money with friends, through catalogs, at events, and in your retail business. Africa Imports DOES NOT operate a multi-level marketing function. We do not collect sales tax, process credit cards, or help with order fulfillment for your customers. There are NO hidden fees, NO contracts and NO maintenance fees associated with wholesale accounts. If you are only interested in purchasing some items for yourself, start a retail account today. Prices for retail accounts are NOT the same as wholesale, and there is no order minimum with retail accounts. Your first wholesale order placed has a $100 wholesale order minimum, unless you purchase one of our Starter Kits. All orders after your first have a $50 order minimum. There are no account fees, no annual membership fees, or any hidden charges associated with your wholesale account. You can order as much as you want, as often as you like, but note that wholesale orders under $50 will be charged a $5 small order fee. What else do you get with a wholesale account? Almost every month, Africa Imports brings you new wholesale fliers as well as ongoing pre­approved marketing assets and business tips to bring you new ideas to get more sales. As a new wholesaler, you're automatically enrolled in our weekly emails, giving you new product announcements, promotions, free offers, and business growing tips to help you succeed. The Africa Imports Customer Service team is here to help you throughout each step. From placing orders to asking questions about new products, we always have you covered. Here are a few ways to grow your business. You find out about all of this with your Success Guide. Click on these links to learn more, be more successful, and make more money. It's easy. Africa Imports has already tested thousands of different product ideas from across Africa. You will know what your customers want before you start. There is a giant selection of African products on hand at all times. All orders are filled within one business day, so you can order what you need today, and get it tomorrow. You can give customers more selection, and you can get their order when they want it. Africa Imports also gives you more promotional material than you could ever duplicate on your own. You can give your customers large, professional quality catalogs filled with ideas that you can't find anywhere else. You have access to a giant source of information about African art and culture in general; and over 1,500 individual products as well. We've done most of the work for you, so you can avoid many of the problems that other new businesses fail over. It's Free. You can start with no money. You do not need to spend money up front to get started. You will make even more if you invest at least a small amount to get samples. You will make more yet if you order enough inventory to let your customers find something that they will want to own, buy and take with them right away. But you can also take orders for the products from our catalogs; or from your own website without buying products first. See our Starter Kit. It's only $49 with free shipping. Everything is 100% guaranteed. If your order is not everything that you want it to be, you can return anything you are unhappy for any reason at all (or even for no reason). You will get either a full refund, or you can exchange it for something else. The choice is yours. This must be done within 30 days of purchase. We're here to support you. We want to do all that we can to help you succeed. If you are successful, then so are we. If you need help or advice, you can call on us any time toll free at (800) 500-6120.